This dish is a great way to use the glut of summer vegetables currently available. 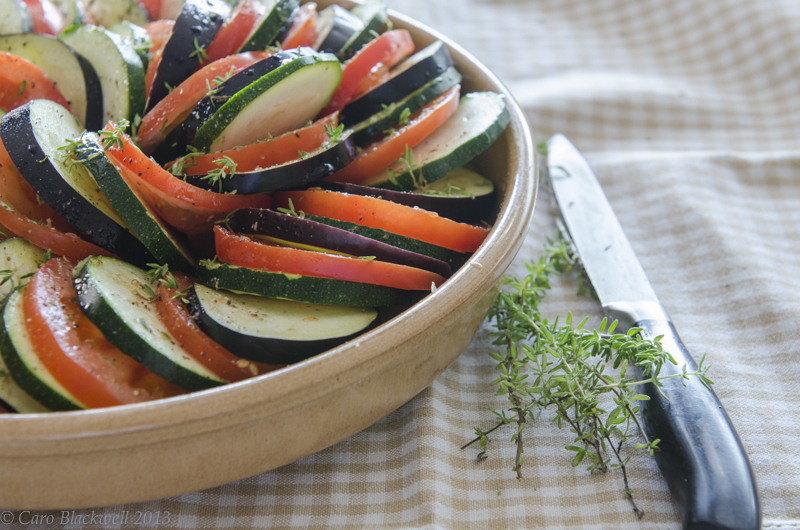 The vegetable Tian is a baked vegetable dish hailing from the Provence region of France, but as these vegetables are all readily available in the Haute Savoie in the summer, I thought I’d give it a try. Whilst researching recipes for this dish, I found that one can use a wide variety of vegetables and the name Tian actually comes from the dish that this dish is made in. A Tian is a colourful earthenware dish used in Provence for cooking and serving in. It is a shallow dish normally glazed in the inside and unglazed outside. 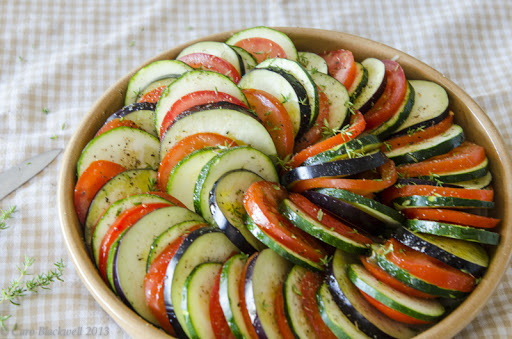 This is great served as a vegetable side dish, or a main course with crusty french bread. 1. Cut a piece of parchment paper to the size of a ‘Tian’ ceramic baking dish. Set aside. Butter the inside of the dish and set aside. Preheat the oven to 180C. 2. Remove the root ends of the leeks and cut the leeks just where the white part meets the green top. Slice the white leek segments in half lengthwise and halve each. Slice leek quarters crosswise into ribbons; scrape into a bowl and fill the bowl with water. Swirl the leeks around in the water until they start to separate and release the grit between the layers. Once the leeks are clean, drain them in a colander. 3. While the leeks are draining, peel and mince the garlic. 4. Remove the ends from the courgettes and aubergines and discard. Cut each crosswise into rounds about 1-2 cm thick. 5. Remove the stem ends from the tomatoes and discard. Cut each crosswise into rounds about 1/2 cm thick. 6. Coat a small pan with olive oil and heat. Add the garlic. Then add the leeks. Cook, stirring frequently until the leeks have begun to soften and the garlic has released its fragrance, approximately two minutes. 7. Spread the leek and garlic mixture across the bottom of the baking dish. Sprinkle with salt and a few grindings of fresh black pepper; strip the leaves from one of the sprigs of thyme and sprinkle over the mixture. 8. Layer the courgettes, aubergines and tomato on top of the leek and garlic mixture, alternating each and overlapping. Drizzle with olive oil and splash with the wine. Sprinkle with salt and a few grindings of fresh black pepper; strip the leaves from the remaining thyme and sprinkle over the layered vegetables. 9. Butter the cut parchment paper and place, buttered side down, on top of the vegetables. Bake for 35 to 45 minutes, depending on your oven; until the vegetables are soft but not mushy while the edges are nicely crisp and brown. However you can try any other vegetables like summer squashes or peppers and substitute the leeks for onions. Some recipes I found included sliced potato and black olives. So you see anything goes!